Priplak® Supercristal was the benchmark grade of gloss clear polypropylene for over five years. It’s now evolved into NEW Supercristal + and the bar has been raised again. Using advanced technical solutions, Priplak Supercristal+ is clearer than ever, and around 35% lighter than “older” plastics like PET and PVC – offering the chance to save money on material and waste. 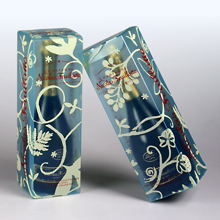 100% recyclable – and offered in an expanded range from 300 to 1200 microns, the new grade is ideal for any clear packaging project – and easy to print, cut/crease and glue. * Contact your local sales outlet for the new promotional pack – and experience the clarity for yourself. *Gluing polypropylene requires special equipment and ahdesives – such as PUR hotmelt that are adapted for PP. Widely considered to be the rightest gloss/textured polypropylene on the market, Priplak® Cristaline offers a great deal of design potential. Two very different sides – a highly polished gloss top side which really shines, and a reverse, (toothy, textured) pearl side, that sparkles with reflected light. Priplak® Cristaline is only ever produced with 100% transparent grade polymer which really makes a big difference to the finished product. Ideal for folders and binders, document holders and cases; upscale invitations, and covers. 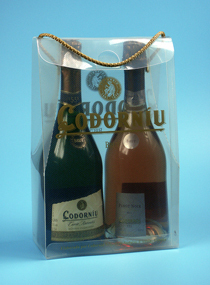 Also an excellent choice for luxury packaging – especially when partnered with high quality gold or silver foil. 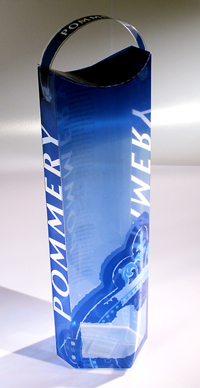 High gloss, shiny and reflective top side with parallel lines embossed at 45 degrees to the edge. The reverse is a pure gloss finish, and the end result great for striking boxes or folders or indeed any product that wants to stand out from the crowd. Please ensure that you are completely sure which way the lines will run on your finished product.